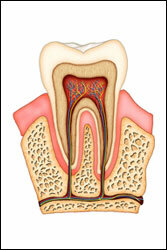 For our patients in Frederick, MD root canals are tiny passageways that branch off from beneath the top of the tooth, coursing their way vertically downward, until they reach the tip of the root. From our dentists in Frederick, MD root canal therapy is a remarkable treatment with a very high rate of success, and involves removing the diseased tissue, halting the spread of infection and restoring the healthy portion of the tooth. In fact, root canal therapy is designed to save a problem tooth; before the procedure was developed and gained acceptance, the only alternative for treating a diseased tooth was extraction. Most patients who have a root canal experience little or no discomfort or pain, and enjoy a restored tooth that can last almost as long as its healthy original. Dr. Pratik Patel is our Endodontist here at Pearlfection Dentistry. He is a native of Virginia and graduated from The George Washington University with a Bachelor of Science in Biology and a Bachelor of Arts in Computer Science. He received his Doctor of Dental Surgery from SUNY at Buffalo, School of Dental Medicine and completed his General Practice Residency at Lehigh Valley Hospital in Allentown, PA. To learn more about Dr. Patel and his practice, please visit his website. For more information on Root Canals in the Frederick, MD areas call Dr EJ Stringer, DMD & Dr Joseph Mullen, DDS at (301) 663-5550!